The biggest health news of last week was undoubtedly the FDA approval of Roche’s Ocrevus for a severe form of multiple sclerosis. 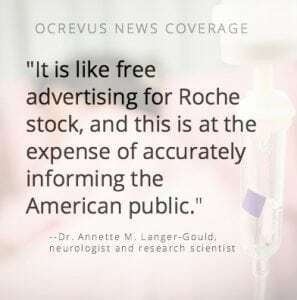 The New York Times, the Associated Press, CNN, NBC News, Fox News, STAT News, HealthDay, TIME.com, and Reuters–and many others–wrote about the drug, also known as ocrelizumab. When we peeked behind the headlines, though, we detected a major issue widely discussed by MS patients and experts online but not being addressed in the mainstream news coverage: Is Ocrevus any better than its very close cousin, the well-established and cheaper drug Rituxan (rituximab) that is also made by Roche but which now faces price competition from “biosimilars” (the biotech version of generics)? When it comes down to it, in other words, is this more about money and less about a new breakthrough? Neurologist and research scientist Dr. Annette M. Langer-Gould says yes. 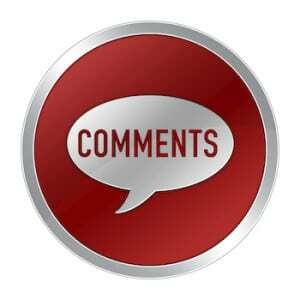 When she read about Ocrevus’s approval in major media outlets, she was disappointed and described the reporting as “glowing, unabashed, buy-Roche-stock-now.” She left a comment on the New York Times story stating the drug is nothing more than an “expensive, overdosed version of Rituxan,” and she mentioned the need for more balanced news reporting. We reached out to her for more details. Langer-Gould speaks from an insider’s perspective: She used to work for Genentech (now owned by Roche) and helped conduct research on these drugs before going back into patient care. She said there is plenty of deliberate manipulation on the part of pharma marketing departments to curry positive media coverage (by crafting fake “breakthroughs,” etc). There’s no evidence that the media intended to publish misleading Ocrevus news, but due to incomplete reporting, that’s arguably what has happened here. (See more on the problems of fake news and sloppy reporting in “Pollution of health news,” a recent editorial by HealthNewsReview.org publisher Gary Schwitzer published in the BMJ). So what did Langer-Gould feel was missing–and what would have elevated the news coverage so that it does accurately inform the American public? Because of this safety concern, her clinic is not planning to switch their roughly 800 MS patients off Rituxan to Ocrevus. Kaiser Permanente, Langer-Gould’s employer, is one of the few insurance plans in the U.S. that cover Rituxan. None of the stories we read included experts’ concerns about dosing. But many stories did discuss–at least superficially–the potential for safety problems to emerge now that the drug will presumably be used more widely. The AP, HealthDay, the Times and STAT News, for example, mentioned the higher risk of tumors in the Ocrevus treatment group, as measured in the drug company-funded study published in the New England Journal of Medicine. “We feel that the industry needs to start to reverse this trend, and believe that pricing Ocrevus 25 percent less than the comparator in our trials is an important first step,” the company was quoted as saying in the Times. Reuters put it more aptly when it said the lower price “undercuts” the competitor. They also mentioned the competition Roche faces from biosimilars, which are generic–and cheaper–versions of these types of drugs. The $65,000 also is just a starting price, Langer-Gould said, and six months from now they’re likely to raise it, which is a common industry practice. Additionally, and more importantly, this price ignores the reality that the nearly identical drug Rituxan–the one Langer-Gould uses for her patients and is also used off-label for MS in the European Union–is a little under $10,000 a year (when dosed for MS patients), has a well-known safety profile, and is likely just as effective. Because Rituxan is approved for use in cancer treatment and a few other autoimmune diseases, but not MS, few Americans with MS have easy access to Rituxan. That’s because Roche chose not to pursue FDA approval for it for that use (a move, some have alleged, intended to sideline an effective drug that was losing its profit potential and replace it with a far more lucrative one). 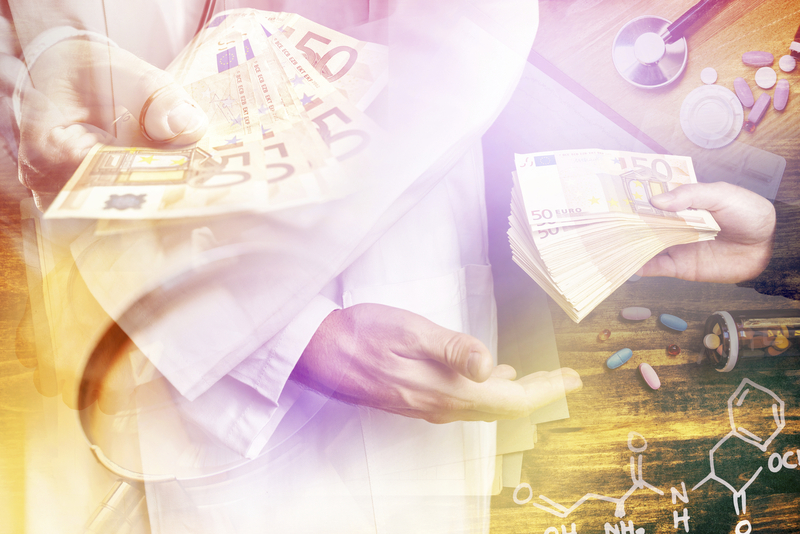 This means that most insurers don’t cover Rituxan, but will possibly cover the much more costly Ocrevus, adding more financial strain to an already-overburdened healthcare system–making it even harder to afford health insurance. Roche/Genentech, meanwhile, maintains that its decisions were based on patient care considerations and not profits. “We advanced [Ocrevus]…into late stage development because we believed it had the best potential for efficacy and safety in people with MS, a disease where long-term treatment is warranted,” said Peter Chin, medical director at Genentech, in an interview with Multiple Sclerosis News Today. Rixtuan and Ocrevus are not the same medication, the later is a chimera monoclonal antibody made from human and mouse B cells, whereas the former is wholly human monoclonal antibody. They act differently on the immune system. Moreover, the cost for Rituxan is close to the $65,000 tag that Ocrevus is asking, $10,000 would not cover 1/2 of one dose of Rituxan. This article is an extremely one-sided story. Thanks for your comments, yes, the post was the sole perspective of a physician-researcher viewpoint we don’t often hear in news media. I don’t believe the post indicates that there is any 1:1 relationship in dosing between the two drugs. Also, Langer-Gould and others feel strongly that the chimeric vs humanized formulation is not a significant enough difference to frame Ocrevus as a major blockbuster breakthrough, and it’s more like these drugs are close cousins versus distant relatives. 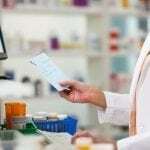 In terms of costs, it’s going to vary and fluctuate depending on where you live, but the cost you mention is what a typical cost might be for a rheumatoid arthritis patient, in terms of number of infusions and amount of dosing. What’s given to MS patients off-label is typically lower, 50% or lower. 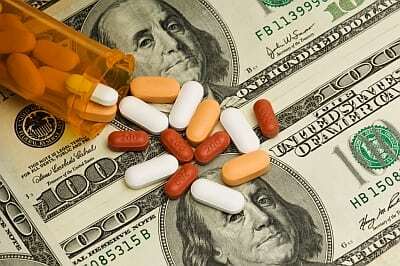 However, finding actual costs of drugs is extremely challenging no matter the health condition, due to the U.S. opaque healthcare system, and so I welcome any citations/sources you have that indicates it’s close to $65,000? For what it’s worth, Langer-Gould’s sentiments are not unique, especially among clinicians in Europe, but also stateside. Authors: Ilya Kister, MD, from the Department of Neurology (I.K. ), NYU Multiple Sclerosis Care Center, NYU School of Medicine, New York, NY; and John R. Corboy, MD, Department of Neurology (J.R.C. ), University of Colorado School of Medicine; and Rocky Mountain MS Center at University of Colorado (J.R.C. ), Aurora. I have a son with MS and finding the medication have been difficult, my child is now 15 and was diagnosed at 12…. I really appreciate hearing the truth about this medication before I tried to fight was my insurance to get it…. He on Avonex but it’s causing depression and anxiety due to the IM injection weekly…. so if there any info out there that you can help me find it would appreciate.